The famously bicycle-friendly city says its “smart-bike” program, Biketown, was worth the wait. Last week, Portland, Oregon, launched its first ever bike-share program, and it’s substantially different from the competition. As we’ve previously reported, a Nike sponsorship expanded and accelerated the launch of Biketown, Portland’s new 1,000 bike-strong system. But what really makes Biketown stand out is that it’s now the largest deployment of so-called “smart-bike” technology in the United States. Each bike has its own GPS tracking system and a U-Lock that serves as the checkout point for riders via a pre-paid card or mobile app. 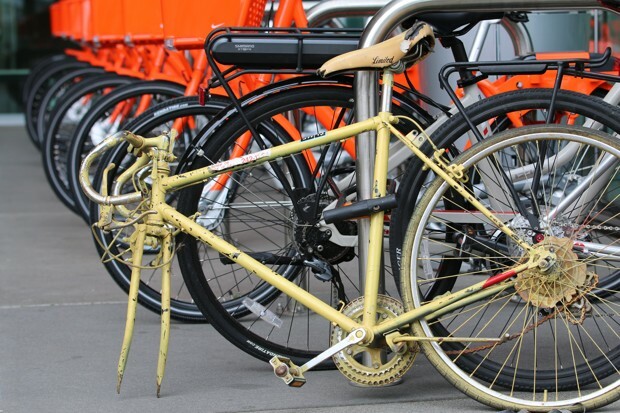 Riders can choose to leave bikes at designated Biketown racks, or pay an additional $2 fee to lock and leave it at any of Portland’s 4,000 bike racks within the service area. Wait, what took Portland so long to do this? It may indeed be surprising to hear that Portland, one of the most bike-friendly cities in the U.S., is only now getting bike-share. In reality, the city has been working on bike-share longer than most. Even before municipal bike-share programs became a concept, a germ of the idea existed in Portland as far back as 1994, when a non-profit organization gave away yellow bicycles to anyone who wanted one. It didn’t go so well. Fast-forward two decades, and the project that eventually became Biketown got snagged a few times too. The city canceled its first request for proposal in 2008 to spend more time studying logistics and funding models. It wasn’t until 2011 that activists such as the Bicycle Transportation Alliance finally convinced the city to resurrect the project. BTA raised $2 million in private funds, and the city agreed to match it with another $2 million in federal funding. It was around this time that Portland’s bike-share effort suffered a “series of unfortunate and accidental events,” says Rob Sadowsky, the executive director of BTA. It would take up to two years for the federal matching funds to disperse, and in the meantime, a series of financial challenges hit the bike-share industry. In 2014, New York’s Bikeshare Holdings purchased Portland’s chosen bike-share operator, Alta Bicycle Share. Then later that year, the company’s major bicycle supplier, Bixi, filed for bankruptcy. “We may be one of the last big cities to get it, but we've learned from a lot of the experiences of the other cities,” Sadowsky says. Hoyt-McBeth, who is also a board member of the North American Bikeshare Association, says the city also wanted to be prudent about its choices. One key decision for the city was hiring Leah Treat. In 2013, she became director of PBOT after working on launches of bike-share programs in D.C. and Chicago. In 2015, Treat announced the city’s intention to launch a bike-share program, with or without a sponsor. Motivate, the rebranded Alta Bicycle Share, would serve as operator. The company agreed to take on the risks of running the program and chose Social Bicycles, or SoBi, as its bike supplier. By the beginning of 2016, Portland had inked a deal with Nike, giving Motivate the ability to expand the program. View of the system map of available Biketown bicycles in Portland. SoBi CEO Ryan Rzepecki says his company wanted to pair the reliability of bike-share stations with the freewheeling nature that bikes bring to a city. That’s a big part of the reason why Biketown allows users more flexibility when it comes to where they can return their bicycles. (The program also gives a $1 credit for returning bicycles, which Rzepecki says will help with re-balancing and reduce operating costs). “As someone who cycles every day, I found that door-to-door freedom was the biggest appeal,” he says. Biketown is also the first deployment of smart-bikes for Motivate, which now runs a dozen bike-share programs in the United States, Canada, and Australia. Those savings should put Motivate on a better financial path, allowing the city and the company to work in tandem toward continuing to expand the system. *CORRECTION: An earlier version of this story misspelled the name of the spokesperson for Motivate. She is Dani Simons, not Tani Simons.